I had a new customer call today about Hazmat LTL (Less than Truckload). He had two 1,100lb pressurized tanks that needed to be shipped from Las Vegas to Phoenix. After asking about the specifications of the shipment (size, weight, packaging etc.) I soon came to realize that this customer would need more insight in regards to packaging, labeling,legalities and the associated paperwork. With a large top-heavy pressurized tank, just getting this piece of equipment onto a pallet was only the start to our challenge. Although there are many freight solutions for Hazardous materials, strict protocol must be followed to ensure proper transport of the goods, safety of the general public, safety of the driver and equipment and to limit any potential damage to the load. I was able to find a simplified outline of specifications and compliance requirements on the Federal Motor Carriers website: FMCSA including a brief summary which outlines the differences between the responsibility of the Carrier as well as the responsibility of the Shipper for these types of loads. * DETERMINE WHETHER A MATERIAL MEETS THE DEFINITION OF A "HAZARDOUS MATERIAL"
In this case, I suggested to my customer that he call the manufacturer/distributor of the tank and ask for their recommended packaging method(s). 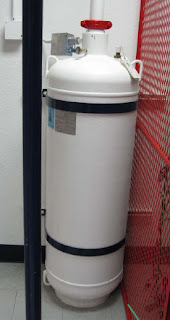 The manufacturer was able to give viable specific information on how they have shipped the tanks to other customers which gave us a great start in preparing the tanks for transport. This example not only reminds us of some of the complicated issues in regards to freight but how many people who are truly willing to help. When in doubt, ask questions.